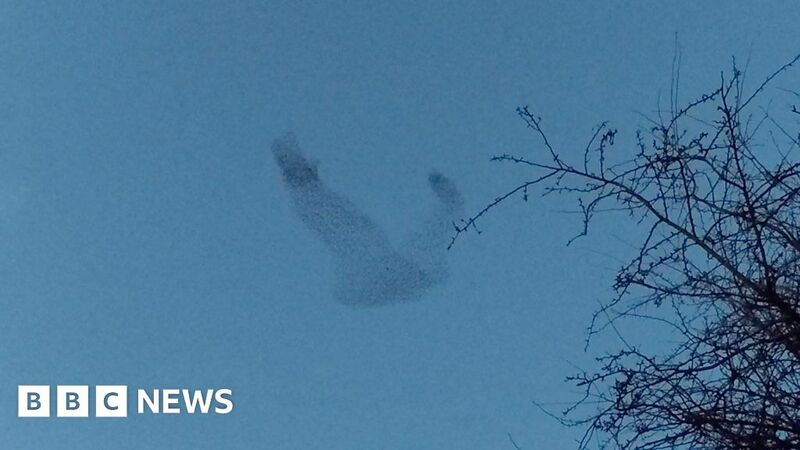 Thousands of starlings left birdwatchers stunned after appearing to form the shape of a bird during a murmuration. Thousands of starlings left birdwatchers stunned after forming the shape of a bird during a murmuration. Birdwatcher Guy Benson captured the sight at the Attenborough Nature Reserve in Nottinghamshire. His wife, Anita Benson, said she and her husband watched the starlings on Christmas Eve when the birds suddenly formed the shape. "It was the most amazing show," she said. "It looks as if the 'bird' flies away. It was a real spectacle." Attenborough Nature Reserve said birdwatchers could expect to see up to 10,000 starlings each evening at this time of year.